In NVC we talk about “Giraffe Apologies” – using NVC to express regret, name the needs not met, and re-connect. This post is the first in a series that will explore how our usual way of apologizing can fail to meet needs, and then how we might do it differently. In NVC there is a distinction between Empathy vs. Not Empathy (telling a story, evaluation, etc) – here is a PDF about it. This week in class we were working with “Giraffe Apologies” and it got me thinking about how many times we say “I’m sorry” to mean something not at all connecting. Apology As Repair: A sincere expression acknowledging responsibility, regret, interest in the other person’s experience and your impact on them, and follow-through to create change, repair, or remedy. All these uses of the words, “I’m sorry” dilute their meaning and can cause some people to recoil at them: “Stop saying you’re sorry, it’s meaningless!”. I personally don’t try to avoid the words “I’m sorry”–but I am mindful to use them from a connecting place, and track that they really are helping create connection when I say them. 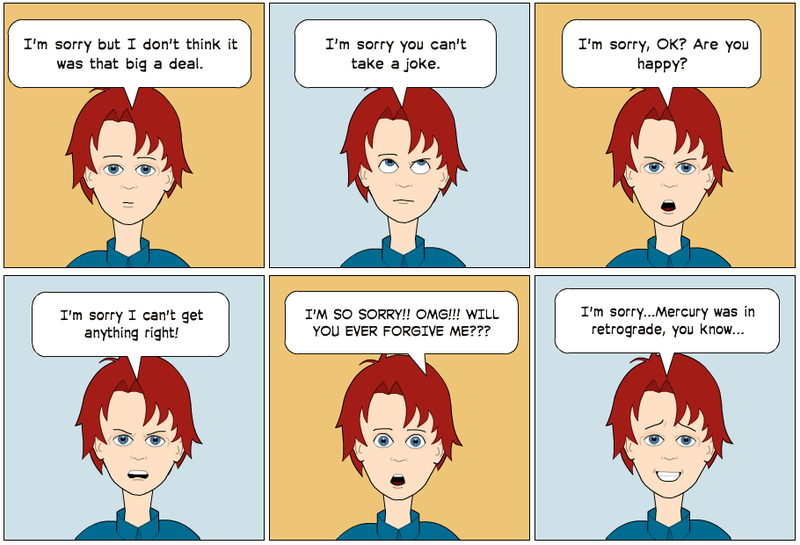 Usually more needs to be said than just, “I’m sorry”–a full apology-to-connect includes an exploration of what happened, empathy for feelings and needs unmet, and collaborative discussion about what might meet needs better in the future. Hey, I totally have been on either end of each of the above examples of sorry cop-outs, so to speak. One I would add to the list is the self-depricating sorry, the “Sorry. I just mess everything up… I can’t do anything right…” kind of attention-getting apology that requires the offended party to focus on the person who’s initially at fault, while possibly being robbed of the chance to feel validated / recognized / get a sense of closure. 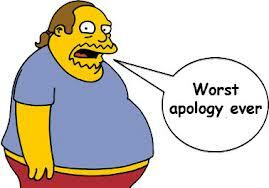 thank you very much for your very recognizable, sharp, funny and moving list of not-effective apologies! I am very happy to read them because they illustrate so well how things can go wrong when we fail to find the right words (or the right intention, understanding and empathy inside first..). Right now I am preparing a lecture on reconciliation and your examples are very helpful ( I will not copy your text, it is yours, but I would like to quote a few and give a link to the public, I hope that is OK with you? Sure, please feel free to use whatever is helpful!